A screenshot of GTA IV: The Lost and Damned. 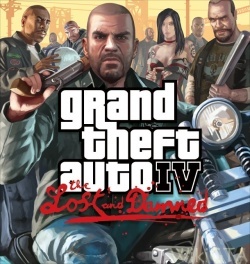 Grand Theft Auto IV: The Lost and Damned is the name of the first downloadable content packs (DLC) of Grand Theft Auto IV. As from February 17th 2009 this expansion is available for the GTA:IV Xbox 360-version at the Xbox Live Marketplace for the price of $19.99 or €15.60. The expansion will also be available on disk in the expansion pack Grand Theft Auto: Episodes From Liberty City at the end of the year. This pack includes both the expansions GTA IV: The Lost and Damned and GTA: The Ballad of Gay Tony. The expansion will provide extra missions around the story of Johnny Klebitz, a member of the motor gang The Lost. The Lost and Damned also contains new multiplayer modi, weapons, vehicles, websites, achievements and music. At last there is also a new minigame: arm wrestling. The Lost and Damned contains a lot of new motors with improved properties, wherefore Johnny will be more stable on his motor and you won't be falling of as quick as in the original game. Grand Theft Auto IV: The Lost and Damned coming February 2009 - Announcement of GTA IV: The Lost and Damned at Rockstargames.com/IV.